Mexico is a country that is rich in history, tradition and culture and there is evidence of its past peoples, cultures and cities throughout the country. Pre-Columbian ruins are dotted across Mexico including the Mayan pyramids of Chichen Itza and Tulum, the Zapotec capital of Monte Alban and the ancient city of Teotihuacan. Mexico’s colonial history is also evident in towns such as Oaxaca, Merida and Puebla. Mexico was first populated more than 13,000 years ago by complex indigenous civilisations. The great Aztec empire was preceded by advanced civilisations including the Olmec, Toltec, Teotihuacan, Zapotec and Maya. The Olmec were in fact Mexico’s first known society, who settled near what is now Veracruz on the Gulf Coast and are known for their carved head sculptures. The Zapotec built their capital at Monte Alban near Oaxaca, and it is thought that it was home to around 10,000 people. Teotihuacan was built near present day Mexico City between 100 BC and 700AD. It is the largest pre-Columbian city in the Americas, and at its height had an estimated population of over 200,000. The Mayans thrived between 250 and 900AD and their cities feature ceremonial centres with plazas surrounded by temple pyramids and palaces. The Aztecs were the last of the great civilisations of pre-Columbian Mexico and they ruled most of Central Mexico from 1428-1521 from their capital at Tenochtitlan, now modern-day Mexico City. 1519 marked the arrival of the Spanish under Hernan Cortes and in May 1521, the Aztec empire was conquered and Tenochtitlan captured. Over the next 50 years, Spain took control of a large proportion of the Aztec empire, enslaving its indigenous population. Millions of indigenous people died as a result of diseases brought in by the Spanish. Catholic missionaries began to arrive in 1523, building monasteries and converting much of the population of Nueva España (New Spain) to Catholicism. By José Salomé Pina – Portrait of Cortés at Museo del Prado. Mexico was part of the Spanish empire for three centuries, administered as the Viceroyalty of New Spain. It began its struggle for independence in 1810, instigated by a call to rebellion by the parish priest Miguel Hidalgo y Costilla. Independence was finally gained in 1821 under the collaboration of rebel leader Vicente Guerrero and defected royalist general Agustín de Itúrbide who later declared himself president in 1822. Itúrbide was overthrown by Antonio López de Santa Anna in 1823 and in 1824 the Republic of Mexico was founded followed by years of political turmoil, military uprisings, foreign invasions, loss of territory and civil war. The Mexican-American War ran from 1846 to 1848 and resulted in Mexico’s territory being reduced by half. By 1855, Santa Anna had gone into exile. By The original uploader was Ruiz at Spanish Wikipedia – Zapata rebelled against Madero in 1911, because of Madero’s slowness to implement land reform. France invaded Mexico in 1862 and Maximilian of Austria was installed as emperor in 1864, until he was overthrown in 1867 by rebel forces. These rebel forces were led by Benito Juarez who became president of the Restored Republic. 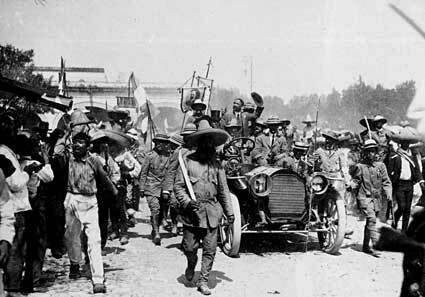 The “Porfiriato” period under the dictatorship of Porfirio Diaz began in 1876, ending with the Mexican Revolution of 1910, a violent civil war that lasted for 10 years, killing a tenth of the population. 1934 saw Lazaro Cardenas becoming president and re-establishing the system of communally shared tracts of farmland that benefitted both the Mexican people and the economy of the country. A new constitution was established in 1917 to ensure permanent democracy in Mexico. 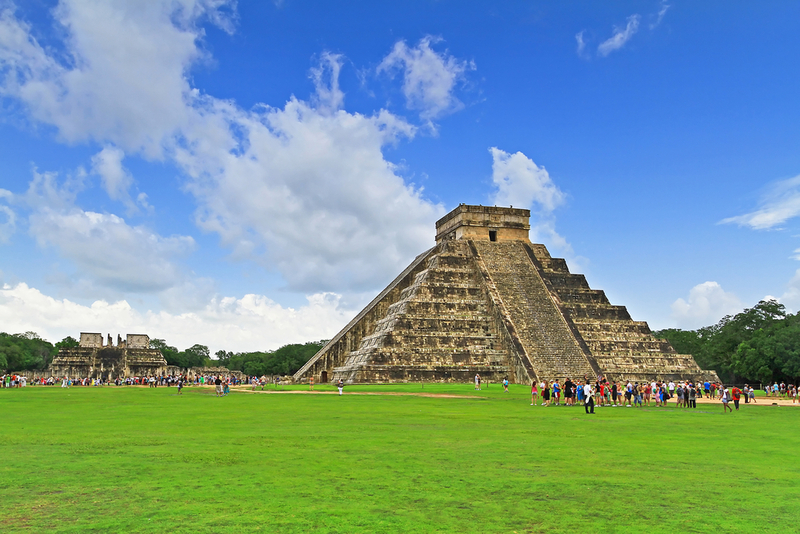 Discover the rich and fascinating history of Mexico on a Mexico Tour. Chimu Adventures offers tailor-made packages to Mexico and Central America. Contact us for more information.